The TI-30 was a scientific calculator manufactured by Texas Instruments, the first model of which was introduced in 1976. While the original TI-30 left production in 1983 after several design revisions, TI maintains the TI-30 designation as a branding for its low and mid-range scientific calculators. The original TI-30 was notable for its very low cost for the time, around US$25. This was much less than the retail prices of other scientific calculators of the era; for example, Hewlett-Packard's cheapest scientific calculator at the time was still well over $100. The Casio FX-20, another popular scientific calculator, sold for roughly double the price of the TI-30. The TI-30 sold for less than the cost of a professional grade slide rule. The TI-30 sold an estimated 15 million units during its lifespan from 1976–1983. Although the MSRP in the US was US$24.95 at introduction, it is rumored[according to whom?] that the original TI-30 got its name from a planned retail price of US$29.95 or $30. 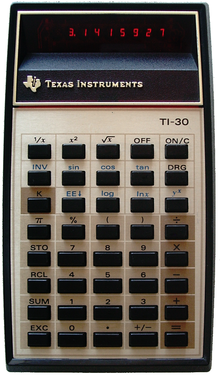 The original TI-30, a cost-reduced but functionally equivalent version of TI's SR-40 unit, utilized an LED display, was powered by a 9-volt battery, and contained nearly all of its functionality in one chip, where previous calculators used many discrete components. The TI-30 could perform nearly all the logarithmic and trigonometric functions of an HP-21, its primary competition at the time. Although the Texas Instruments SR-50 pioneered algebraic notation with precedence and parentheses in 1974, the TI-30 made those features available at a more affordable price. Early production TI-30 units (c. 1976) contained a logic error in their calculation of inverse tangents. On these early models, pressing "0 INV TAN" would cause the calculator to go into an infinite loop until it was powered off with the OFF button. The "0" had to be pressed on the keyboard; the calculator produced a correct answer if the "0" was the result of a previous calculation. The TI-30 was at one point the most popular scientific calculator for junior high and high school use in the United States. For $24.95, the purchaser received both the calculator and a 224-page book, The Great International Math on Keys Book, which covered basics in algebra, business and finance, trigonometry, probability and statistics, physics and chemistry, and had ideas for games and puzzles that could be played with the calculator. In 1980, Texas Instruments converted the TI-30 to use a liquid crystal display, releasing the TI-30 LCD in Europe and the TI-30 II a year later in the U.S. The calculator itself remained functionally similar over several redesigns in the following few years, with solar power coming to the line in 1982 in a joint venture with Toshiba. The "X" in all current TI-30 models refers to the addition of a 10+2 display (that is, a 10 digit mantissa plus a 2-digit exponent) in 1993; with the addition of a 2-line display and a D-pad in the XIIS/XIIB in 1999, the TI-30 line split in 2, with the TI-30Xa becoming TI's overall entry-level scientific, and the enhanced XII designs offering more input flexibility to the user. The MultiView models, introduced in 2006 and 2007, replace the 2-line display with a dot matrix display similar to a graphing calculator, and move many of the functions traditionally placed on or next to individual calculator keys off onto menus very similar to those used on the popular TI-83 calculator line. At one time or another, most models in the line since the introduction of the LCD models have been available in both solar powered and battery versions; the Xa retains solar power only on models sold in a few markets in Europe, while the XIIS and XS MultiView models run off both solar and battery power depending on available ambient light. The earliest model, however, ran off of a 9 volt battery, and was said[by whom?] to drain the battery quite quickly, creating a market in aftermarket rechargeable battery upgrades. Demonstration of the so-called "logarithm bug" that exists in some TI-30 models. In both cases, the value of ln(1.0000001) was calculated. TI-30 LCD (1980): the first LCD version. European market only. TI-30X (1993): the X signifies an expanded 10 digit display (from the original 8). Switching to a new circuit board design introduced a logarithm bug. TI-30Xa (rev 1996): introduced a more modern, smoothed design. Currently the bottom of the TI-30 line, the Xa has a standard one-line, 10+2 digit display. The solar-powered eco RS model is available only in Europe. TI-30Xa Solar School Edition (2004): a modified version of the TI-30Xa, without the fraction buttons. This calculator is approved for Virginia State Testing. TI-30X IIS and TI-30X IIB (1999): added a two-line, scrollable display and a D-pad for navigating previous results. Solar/battery and battery powered respectively. TI-30XS and TI-30XB MultiView (2007): first non-graphing TI calculators with a dot-matrix display; able to display expressions in textbook-style notation. Uses a command syntax similar to TI-BASIC, but with no programming capability. TI-30X Pro MultiView and TI-36X Pro (2011): In addition to the features TI-30XS and TI-30XB MultiView, it features a solver, availability to calculate matrices, vectors, complex numbers and convert different units. The TI-36X Pro is the American and international version of the European model, the TI-30X Pro MultiView. The TI-30X Pro MultiView was released in 2010 and then promptly recalled because of programming errors. It was re-released in 2011. TI-30XA (2013): retained the size and shape of the 1996 model, having buttons rounded on the bottom, and the color of the "2nd" button changed from yellow to green. With introduction of a new circuit board in 2015 the logarithm bug was fixed, also the calculator switched to using just one 1.5V battery instead of two. TI-30X Plus MultiView (2015): a TI-30X Pro MultiView without certain advanced features. Only released in Germany, Austria, and Switzerland to meet the requirements of certain high schools that ban the removed features. The Great International Math on Keys book is a problem-solving guide exemplifying usage of electronic calculators, in particular TI-30 with Algebraic Operating System, developed by the staff of the Texas Instruments Learning Center in cooperation with the staff of the University of Denver Mathematics Laboratory in 1976. ^ "Texas Instruments TI-30X at DataMath calculator museum". Retrieved 10 May 2017. ^ "Texas Instruments TI-30XA at DataMath calculator museum". Retrieved 10 May 2017.